Boston College wins LNB Feminina 2015 as they celebrated three victories at the Final Four of the country. In Day 1 they overcame Univ.de Chile 68:60 as Venecia Castaneda (G-84) and Jenifer Fuentes (178-F-96) netted 14 each. Lorena Infantes (170-PG-81, agency: Regeneracom Sports) replied with 23 points in the losing effort. In Day 2 Boston College outscored Sergio Ceppi 71:51 and then triumphed with the 64:57 win over Brisas. In the last game Marisol Gamboa (178-F-86) stepped up with 19 points and Jenifer Fuentes had 13. 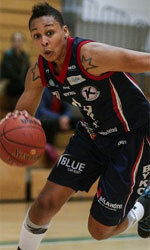 Arlenys Gonzalez (185-C-87) finished the game with 24 points and 13 rebounds in a loss.